This past weekend, our kids were all away on various adventures, so Andy and I took a tiny little road trip, down through the Texas hill country. 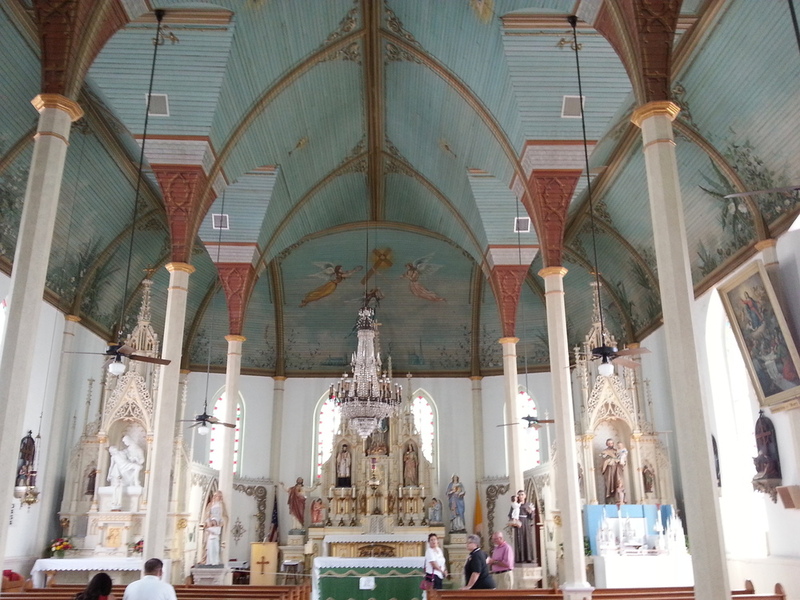 We had a destination in mind: Schulenburg and the Painted Churches. Day 1, we meandered down the back roads, through little towns like Glen Rose and Hico and Lampasas. The wildflowers were blooming everywhere, sometimes whole fields of yellow and orange. We saw lots of longhorn cattle, horses, and donkeys. The buzzards were out in force, feasting on numerous pancaked armadillos. There were windmills and rusty barns, taco stands and barbecue shacks. We had a chopped brisket sandwich for lunch with a brisket-and-cheese stuffed jalapeno on the side. We marveled that we could sit outside, under the shade of a live oak tree, on the 4th of July, without suffering heat stroke. We drove on to Enchanted Rock, and decided to see if we wanted to climb all the way to the top. Turns out, we did. That was about as close to purple mountain's majesty as we get here in Texas. Day 2, we made our way out east of Austin to the little town of Schulenburg, to tour the painted churches. At the Schulenburg Chamber of Commerce, we paid $4 for a map of the area. This worthwhile investment advised us of exactly which little Farm-to-Market road we should take, and how far to take it, and where to turn by the KJT Hall, in order to find the Ammansville church. We would have been completely lost without it. Also, the map told us about the cool "Piano Bridge" which we never would have found otherwise. There's got to be a story behind this fancy bridge. It was built in 1885 by the King Iron Bridge Company of Cleveland, Ohio, to span a tiny creek. From the outside, the Painted Churches are pretty. But, like Andy said when I first showed him the website: "Painted? They don't look painted." The painting is on the inside. German and Czechoslovakian settlers came into this area of Texas in the mid-1800's. When I try to think about what it was like to uproot your whole life in 1846 and move from Bavaria to Central Texas, my mind just boggles. I don't know how these people got through the day alive, much less built these incredible churches within 40 years of their arrival. I'm not going to do what those settlers did. I have used up all the move I ever had in me. But I am finding that, even though my physical body stays in one place, my emotional and spiritual journey continues. Often I find myself, like the settlers, in strange and inhospitable places. And what I want, more than anything--no matter where I am or what is happening in my life--is to have the kind of rich, interior life that these painted churches capture so beautifully. I want a cathedral in my soul, where I can breathe and rest and find the strength to walk on.